If you're an MP3 player junkie, or just like listening to lots of digital music, you'll want to know about a new little converter that does something most other converters just cannot do. It converts video and music to MP3. In fact, MP3 Converter can convert whatever media file you have. But that's just the start for what is a very cool little MP3 Converter. March 12, – MP3 Converter Developer Team today announces the immediate availability of MP3 Converter 2.1, an easy to use tool letting you convert audio and video to MP3 for future playback on an MP3 player, iPod, iPhone, PSP or cell phone. What makes MP3 Converter even more valuable is that you can have it to automatically convert to MP3 more than one media file in the batch mode while you're away doing something else. When it comes to media file formats, there are a whole bunch of them out there and finding a utility that will convert all of them to MP3 has proven to be quite daunting. No matter how many converters you have, sooner or later you're going to come across a file format that refuses to convert to MP3 no matter what converter you throw at it. Fortunately now there is new MP3 Converter, and it's one of the only MP3 converters that can convert most any media file to MP3 in a quick and pain-free manner. Conversion to MP3 with MP3 Converter is a breeze. To begin the process, you run the converter, go and find the media file you are interested, drag and drop it onto the DropZone of the converter, or select the file through MP3 Converter's built-in "Add a File" browser. Then the next step is to set up the output settings, such as MP3 bitrate (32k - 320k), rate (8000Hz - 48000Hz), audio channel (Stereo or Mono) and the folder you want to save the output file to. However if you choose to use the default settings (128 Kbps, 44100 Hz, stereo), it should be fine. When you have prepared everything, conversion to MP3 is quick and easy. Just click "Start Now" button and that's pretty much you need to do. MP3 Converter begins the conversion. In case of big batch conversion, you can see the conversion progress in the Progress Area. Supported media file standards include WAV, WMA, ASF, RA, RM, VQF, OGG, MP3, AVI, WMV, MOV, 3GP, MP4, FLV, RM, RMVB, VOB, DAT, MPEG. 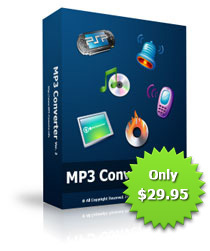 Currently, MP3 Converter is the only MP3 Converter that will support such a long list of formats. This list is updatable and new media formats are added support instantly as they appear. MP3 Converter 2.1 runs on Microsoft Windows 2000/XP/2003/Vista and available immediately as a free evaluation version from http://www.mp3-converter.info. Registration costs $29.95 (USD) and entitles the customer to the fully functional product without limitations, priority technical support and life-of-product upgrades.